Those who attended the annual meeting of the BoatUS National Advisory Council included (front row, from left) Stephanie Weatherington, president, National Association of State Boating Law Administrators; Lenora S. Clark, former California Boating and Waterways commissioner and former Recreational Boaters of California president; Beth Newburger Schwartz, president, Epoch Communications, and wife of late BoatUS founder Richard Schwartz; Boat US CEO Kirk La; Kris Carroll, president, Grady-White Boats; and Jim Ellis, National Advisory Council chairman and former president, BoatUS; (second row); Thom Dammrich, president, National Marine Manufacturers Association; Bob Adriance, former editor, Seaworthy; Robert Baldridge, immediate past chief, United States Power Squadrons; and Mark Simoni, immediate past commodore, U.S. Coast Guard Auxiliary; (third row) Chuck Hawley, former director, US Sailing; Dean Travis Clarke, former executive editor, Bonnier Marine Group; BoatUS Foundation president Chris Edmonston; and RBOC president Peter Robertson. Photo courtesy of BoatUS. The BoatUS National Advisory Council, a panel of 11 national boating leaders who serve as a sounding board for BoatUS, gathered last week with senior BoatUS leaders at St. Simons Island, Ga., to discuss key issues affecting recreational boating. Topics of the daylong agenda included a discussion of the future and direction of recreational boating and a look at the post-election political landscape in Washington and what it means for recreational boaters. High on the list of federal legislative issues was the Renewable Fuel Standard (changing the government’s ethanol fuel mandate), Magnuson-Stevens Act reauthorization (support for national saltwater recreational fisheries policy), the Florida Everglades algal bloom issue (addressing phosphorous and nitrogen runoff), and recreational fishing policy in marine protected areas. On the boating-safety side, the group looked at the vulnerability of the GPS system and new emergency signaling devices/flares, and discussed changes in vessel stability and capacity plates. State docket issues included Hudson River anchorages and Florida anchoring policy, boater education programs and the changing nature of government policy on antifouling paints. 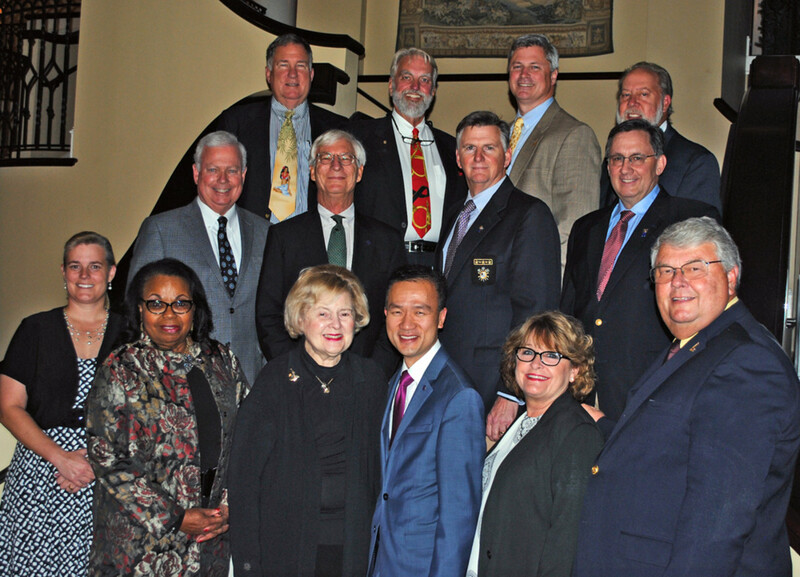 The 11 volunteer leaders of the BoatUS National Advisory Council who attended the annual meeting included Kris Carroll, president, Grady-White Boats Inc.; Lenora S. Clark, former California Boating and Waterways commissioner and former Recreational Boaters of California president; Dean Travis Clarke, former executive editor, Bonnier Marine Group; Thom Dammrich, president, National Marine Manufacturers Association; Chuck Hawley, former director, US Sailing; Jim Ellis, National Advisory Council chairman and former president, BoatUS; and Bob Adriance, former editor, Seaworthy. New members who joined the council this year included Robert Baldridge, immediate past chief, U.S. Power Squadrons; Peter Robertson, president, RBOC; Mark Simoni, immediate past commodore, U.S. Coast Guard Auxiliary; and Stephanie Weatherington, president, National Association of State Boating Law Administrators. BoatUS leadership included CEO Kirk La; BoatUS Foundation president Chris Edmonston; BoatUS Foundation vice president Susan Shingledecker; BoatUS vice president Heather Lougheed; government affairs senior program manager David Kennedy; and vice president of public affairs Scott Croft. Joining the group was Beth Newburger Schwartz, president of Epoch Communications and wife of late BoatUS founder Richard Schwartz.